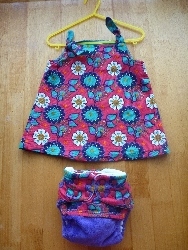 This is the first garment that one of my students Shae has made for her little girl Elizabeth. Shae learnt how to work with nap fabrics and cut the pattern pieces to ensure the printed fabric was balanced in design. Shae also made a special nappy to match. 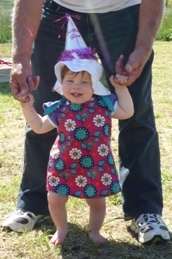 Well done Shae Elizabeth looks gorgeous and has put in her order for many more pinafores please mummy! Abby joined my sewing school as a beginner sewer this year. She started with sewing some sewing for herself, made a gorgeous silk and lace trimmed Christening gown for her daughter Michaela. One of her most recent projects is this quilt featured below where she has learnt the basic techniques of quilting. 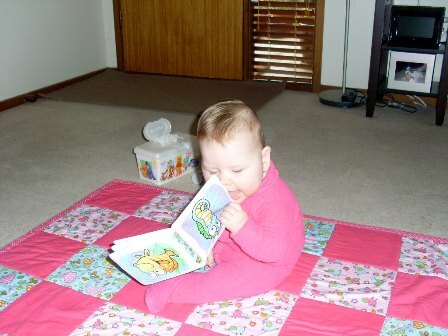 Michaela enjoys reading on her beautiful handmade quilt!